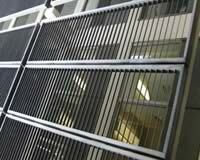 Architectural Metals offers environmentally friendly products manufactured by eliosolar and Flood Panel™ with a wide range of applications for your sustainable design project. We can assist you with your sustainable design by specifying products that can help your project earn LEED points and by helping you evaluate the effectiveness of your design approach. The links on the left side provide more specific information about our line of Green Products — please contact us to discuss the specifics of your project. Architectural Metals is proud to include eliosolar Thermal Shade Structures among its innovative environmentally friendly products. eliosolar Thermal Shade Structures are architectural sun-control and shading devices which include Sunshades, Facade sun shields and Canopies, which contain an integrated solar thermal collector that generates free solar hot water. Thermal Shade Structures are manufactured to your design specifications and unlike other solar collectors, will enhance the aesthetics of your buildings. Thermal Shade Structures save cooling and heating energy by combining a passive solar system (shading) with an active solar system (solar heating). Thermal Shade Structures cost less. These products are eligible for federal and states energy tax credits (30 to 50%). They even pay for themselves over time due to the energy savings generated. Custom manufactured to your design specifications or available in standards designs, in a multitude of shapes, sizes and colors. 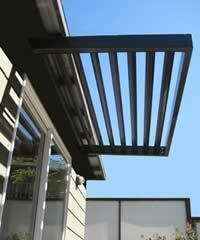 Can be designed in any style to integrate seamlessly in the architecture of the building. A Perfect solution to unsightly alternative energy systems: solar collectors, hidden within the Thermal Shade Structures, are completely invisible. 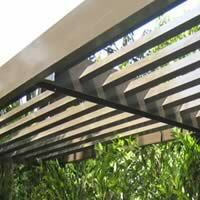 Made to last: Thermal Shade Structures are made of solid extruded aluminum, powder coated for maximum protection and zero maintenance. Thermal solar system are completely protected from the elements, giving it a longevity which extend beyond those of other thermal collectors. LEED certification: Thermal Shade Structures can contribute a significant amount of LEED points to your new construction or renovation project. Save cooling energy. A passive solar system, Thermal Shade Structures provide shade that cools the interior temperature of the building, reducing air conditioning energy demand. Save heating energy: An active solar system, Thermal Shade Structures harness the sun's energy to produce free hot water, reducing the energy required to meet the building's hot water needs. Made from recycled material, and 100% recyclable. Help preserve the environment and reduce your carbon foot print when using solar energy, lowering greenhouse gas emission produced by the usage of fossil fuels. Cost less: These products are eligible for federal and states energy tax credits (30 to 50%) and other incentives, reducing your initial investment by 30 to 50% immediately. A zero cost investment over time: Thermal Shade Structures will actually pay for themselves over a number of years thanks to the energy savings generated. Depending on location, surface, insulation and other variables, your investment will be fully reimbursed within 10 to15 years. A pay back calculation is provided with every quote. Lower building operating costs by reducing utility costs. As gas and oil prices keep rising, tapping solar energy to reduce its energy costs and exposure to the ever rising costs of fossil fuels is an imperative for any business looking to improve or simply preserve their bottom line. Increase the value of your property due to lower operating costs and enhanced architecture. Increase the overall commercial appeal of your buildings and make your properties more attractive and more valuable to potential tenants and buyers. Click here to view the eliosolar Standard Products (ETME) Brochure (6 pages) in a new window. Click here to view the eliosolar Custom Products Catalog (8 pages) in a new window.